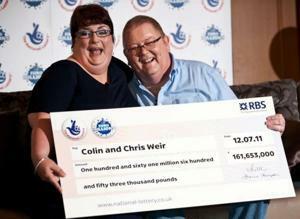 Meet Colin and Christine Weir, Europe's largest lottery winners. They live in a Scottish seaside town. They have been married for 30 years, and they have two kids, plus a three-bedroom house, and now, 161 million pounds (about $260 million). "We were tickled pink. I even had a glass of white wine, which is something I normally only do at Christmas. It really is unbelievable," Chris Weir told the UK's Independent. The two Scots both suffer from health problems and are no longer able to work. The winnings mean they now rank just below the Beckhams (as in Victoria and David Beckham) on the U.K.'s Sunday Times Rich List. Searches on "lottery winners" immediately spiked on the Web with news of their huge haul. Though their EuroMillions jackpot makes them Europe's biggest winners, the world record for lottery winnings is held by Andrew Whittaker, who took home $314.9 million in the Powerball multi-state lottery in West Virginia, in 2002. The couple will earn £5 million a year in interest alone--or "£10 every minute"--as the Daily Mail put it. The luckiest couple in Great Britain may also be the cutest: The two kissed for the cameras at their press announcement. The two had kept quiet since learning of their windfall on Tuesday, but decided to go public since it would be hard to keep the winnings secret. The couple had been having a quiet night when Chris Weir, 55, a retired psychiatric nurse, checked the lottery tickets. However, it was too late to alert the lottery, so the twosome stayed up all night with their big news. So far, the couple's goals seem modest but generous: houses and cars for their two kids, Carly, 24, and Jamie, 22, plus travel to China and Australia for themselves. Colin Weir, 64, a former camera operator, said, "All our lives we have lived within our means and been comfortable. We appreciate that this money brings about a whole new life for us and our family." Wife Weir added about their remarkable win, "We're not scared of it. It's going to be fantastic and it's going to be so much fun."